A class tippet is important to help prevent losing your entire rig on a big sail. But if you’ve never caught a sailfish, you should go with a 30-pound-class tippet to first land a fish before dropping to a lighter class. WHAT OTHER GAME FISH can you catch that is longer than your fly rod? Fisheries scientists tell us that the sailfish is very likely the fastest fish in the ocean, and from personal experience I tend to agree. The entire process of catching a sail on a fly — which starts with the sail attacking the teaser and ends when you finally release the fish — is exciting to the extreme. And for those of you who have yet to try it, this is how it works. A sailfish spread consists of several hookless teasers trolled behind the boat until a sailfish appears behind one of them. Your companions or a crew member then picks up the rod that has the hot teaser and begins to reel it in slowly, playing a deliberate cat-and-mouse game with the increasingly aggressive billfish. You pick up your fly rod, shake some line out of the tip, and get ready to cast. It may seem like a pulse-pounding eternity until the sail is within casting range, but you must wait for the skipper to take the engines out of gear and the teaser to be yanked out of the water. All billfish are totally fearless when it comes to boats. If everything goes as planned, the sail has chased the teaser right up to the transom and is now eagerly trying to relocate it. At this moment you make your cast, but not in front of the fish. Instead, you place the fly as far as possible behind it and generate a loud blurp with the 10-inch foam-head popper. You may even have to work the popper once or maybe even twice more to get the sail’s attention. Once it has acquired the target, you simply wait as it rushes the fly and the line comes tight. Once it’s hooked, a big sailfish can be matched by no other fish on the planet for aerial display and speed. By far the best way to hook any billfish is to have it take the fly as it swims away from you. The very shape of its mouth makes a head-on hookup almost impossible. Thus the boat and its crew are every bit as important as using the right fly. Experience and teamwork count for everything. So, before you plunk down your hard-earned cash and make the long trip, do a little homework and make sure you are not only booking an experienced crew, but also going at the right time of year. If you’ve never caught a sail on fly, I suggest that you go with 30-pound test as the class tippet for the first fish. That way you’ll get a chance to learn how to properly fight the critter; it would be a shame to travel so far without landing at least one. Some areas are more seasonal than others. Guatemala is good almost all year, but the facilities are not so numerous as in Costa Rica, where the best action from January through March is along the southern half of the coast. In the summer, the northern half is better. The coastal town of Quepos, which is good almost all year round, seems to be the geographical dividing point. Everyone who has caught at least one sail on a fly eventually aspires to do the same with a marlin. But unless you go to those few remote hot spots where marlin of fly-rod size are available in sufficient numbers to provide good opportunities every day, it becomes a matter of luck. The same 12- to 15-weight fly rod and reel that you routinely use to catch sailfish will do the job. So will the flies. It’s just a matter of being able to cast to a marlin that’s not too big; 250 pounds or less is about right. In the Pacific, striped marlin are probably your most likely target. The two most productive hot spots are Cocos Island (lying 300 miles southwest of Costa Rica, this requires a large live-aboard sportfisherman) and the Galapagos Islands, where there is a camp. Australia’s barrier reef has produced black marlin under 100 pounds during the winter months. In the Atlantic, a few white marlin have been taken on fly off North Carolina’s Cape Hatteras during the early autumn months. 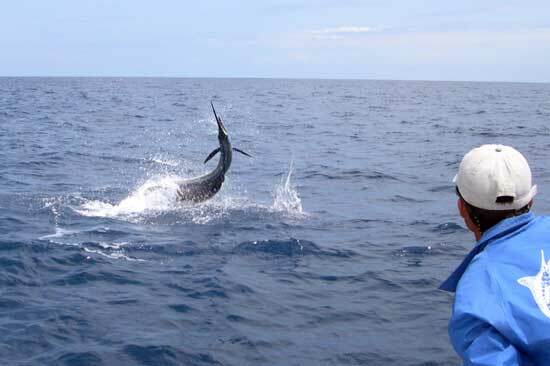 The La Guaira Bank off Venezuela is another fall location that produces more consistent white marlin action than Hatteras, with the occasional fly-rod size blue marlin thrown into the mix. Capt. Ron Hamlin of South Fishing (www.southfishing.com) can provide info on white marlin in Venezuela.